America will need more “cool nerds” in the future. That’s what a recent New York Times article says. Cool (fashionable, impressive) nerds? The word “nerd” first appeared when I was in school, and it wasn’t cool! No one wanted to be a nerd. When I was growing up, a nerd was someone who studied all the time and often became very good at mathematics or some other intellectual (mental, thinking) activity. Nerds didn’t usually participate in sports or social activities, like going to school dances or parties. There were usually very few nerds in school and they usually hung out (spent time, relaxed) together. Another, similar word came around (appeared) a few years later. The word is “geek.” Sometimes geek and nerd are used to mean the same thing. However, there are usually some subtle (not easy to notice) differences. Probably the most common use of geek is to refer to someone who has a special interest in technology, like computing. Here in the U.S., there is a business called the “Geek Squad.” If you have trouble with your computer, you can call them, and they will come to your house and fix it. Not everyone is happy about these words. One American professor thinks they should be avoided (stayed away from). He says that using words like geek or nerd perpetuates (preserves, keeps alive) a negative stereotype (a popular, often wrong, belief about someone). 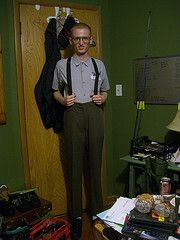 The photograph above is a popular stereotype of what a nerd looks like. Other people think the words are okay. They say that the meanings of words often evolve (develop, change) as the social context (situation) changes. According to the New York Times article, being called a “cool nerd” is a compliment (praise). It identifies someone who is smart, does well in school, and does well in other things, too. The professor insists, however, that in most of America, geek and nerd still have a negative image. He believes that most people will try to avoid geeks and nerds. The best thing to do, in his opinion, is to “put them to bed” (stop using them). I have to smile when I read that because I discovered that this same professor has written a book. Would you like to guess the title? It’s called Nerds: Who They Are and Why We Need More of Them. Now, back to my part of the story. While I was researching this post, I went online, Googled “nerd” and “geek,” and discovered that there is a test that will tell me what I am. It’s called the Geek? Nerd? or Dork? Test (a dork is someone who is not very smart, not good with people, and not aware of what’s happening in the world). I couldn’t believe it! Me, a pure nerd? Impossible! Wow! I sure hope they’re right! ~ Warren Ediger – ESL tutor/coach; creator of www.successfulenglish.com where you can learn more about how to improve your English. Photo by My Blue Van used by permission. A lot of new words, thank you Warren. By the meaning of Nerd or Geek I do think that here doesn´t like these kind of people among the young in the schools, and afterward at the university. Why?. I don´t know, but the common behavior is to be against them as the majority thinks these persons are odd?. In fact one of my daughters had some problems with her fellows at the school because she was very smart nearly about everything, and we, my wife and me, need to said her not to answered all the questions that the teacher asked or just tried to be less clever if she wanted not to have more difficulties with the other girls or boys. If I think about me, just the same problem, I didn´t like to practice any kind of sport as I always prefer to be reading or playing chest or another kind of mental entertainment. I didn´t like also to smoke or drink at the bar talking about football with other fellows. So I was odd too. Yes, I know what are you talking about. Thank you Warren, it´s very interesting matter and lots of new expressions, I like your post very much. It’s better for every body if we respect a”balance” in our life. However, I never want to be in “desaccord” with my opinions. It’s only my opinion, nothing else. bye Warren, Later on the net. what a hard life when you are a kid !! . . it’s always been unpopular doing what you’re supposed to do instead of behaving like a naughty boy/girl . . i guess that at that age it’s all about looking for fun . .
at least you will get the chance of being appreciated in the future . . though you had to spent your childhood getting stronger by ignoring the other kid’s laughs . .
you can learn a lesson of almost everything in this life !! Very good article…You should do podcast because there are a lot of difficult words…I don’t know its pronunciation…. Thank you so much for this great blog! Your articles are very interesting and its always a pleasure to read them. Its not only helpful to improve my English, I also learn something new every time. I heard these words from school kids many times but not sure about their natures so don’t know when it’s appropriate to use them. It seems that there’s still not a clear cut between the negative and complementing meaning of the words yet. It may vary from opinion to opinion, so it’s better not to use them as people say, “It’s better to be safe than sorry. Thanks again! Write us more! PS: And, yeah, I do love nerds. Their strangeness and intellect make them different and invdividual. The test itself is not interesting, but I learnerd a couple of useful vocabulary. 😉 is the cool nerd or geek can be a genius? or they are just smart and good at mathmatics or computer things. what if someone call me a “nerd” or “geek”, how should I take it? insaulting way or compliment? i’m still don’t get it. If a nerd person is purly successful, I’ll give you my Congratulations. i am a pure nerd as well. i hope i can be pure successful in the future. For those who are still in doubts who nerds and geeks are and how they look like just watch a couple of episodes of rather popular tv show (comedy) called “The big bang theory”. In my opinion, it provides the best visual example of this kind of people, tells us a lot about their charachters and type of personalities. As for dorks…. I might be mistaken, but Homer Simpson must be one of the most famous dorks, still very charming guy though=) Thanks! I’m sure I’m definitely geek. Because I’m an IT engineer, and loving my job. I got the same results on the test. They wrote that I’m pure nerd too! May be… But I’m also pretty attractive and handsome. Why do people think that if person is intellegent and know very much, it must be unpopular, ugly loser? 🙂 I can’t understand it. How our famous writer A.P.Chehov wrote “There is everything must be perfect in human: soul, body, thoughts”…. And I think it’s truth.